i havent been ragging on this car. i like this car. what i said was, theres no reason for it to be the main topic of discussion as if its an on-going build thread when things arent being built. thats what i said. if i said anything negative about this car, its about it being similar to kurruptr's car.. which again, its just joking around.. nothing serious. Ive been around 240s for no more then a couple of years, if you were to mention all generations of RX7s and MR2s, then I feel I would be alot more 'guru' like/compitent. Just getting into a scene thats already play-ed out (Not drifting, just 240s). Back on topic, no more thread robbing. How I do love some cut off wheel action. no one wants to see you slide the car. but jeez, even jay leno does a burn-out in almost all his videos. 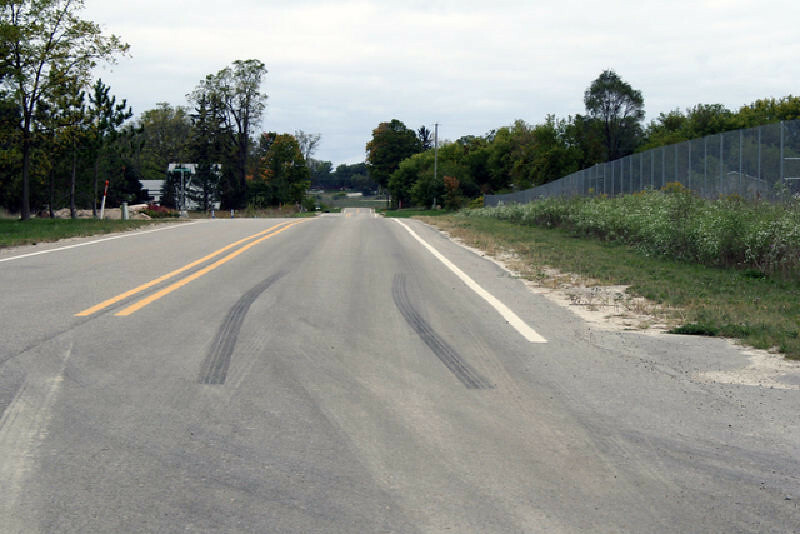 unless there's a cop hiding in every bush in michigan, find a back-road and give it some stick. its just like when im driving on the freeway and i see a sportscar putting along in the slow lane... im not saying everyone should be speed-racer on the streets, but this isnt the rose parade either. people like seeing these cars driven. hit the canyons, strap a camera somewhere and hang your balls out a bit. I also managed to make it out to the drag strip last year- despite my terrible driving skills, I did pull off a 12.9 @ 114. I guess all I am trying to say is the car gets driven a lot- and even abused once in a while. Only posting photos of it parked probably gives off the impression that I never drive it or enjoy it to its full potential- I'll have to get a video together for you guys sometime this summer. In other news, my car was too low to get on the "race" alignment rack. The shop was kind enough to purchase some 1"x6" boards and we are going to take another crack at it next week. Last edited by CamryOnBronze; 07-31-2017 at 07:50 AM.. I've been following your build from the start. IMHO..I couldn't give two sh!ts if you put a ton of parts and don't track or "drift" it. You built it up to where YOU want it to be and I like it. 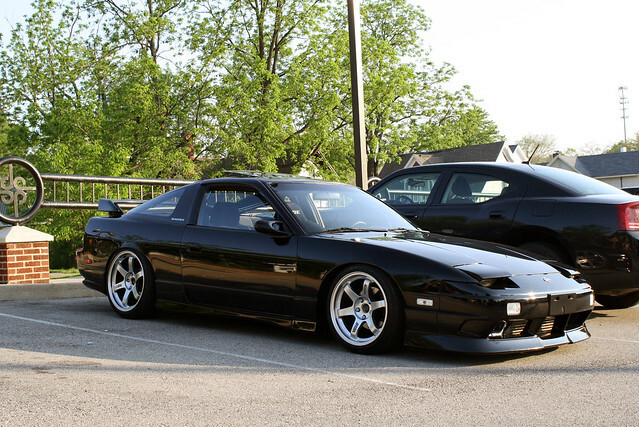 To the naysayers or whatever...not every moddified 240 has to be used and abused. Damon, I'm the same way when it comes to the whole "anti-drift" outlook with these cars. I would never drift a car that I am clearly building as a streetable daily driver. If you want to drift, you build a drift car. Simple as that. However, when I finalize my build I plan on hitting up various tracks and putting down some lap times. I suggest you do so as well! Coolest picture posted in this thread! I must have missed it, but how long did it take you to flare the fenders? "I am not good English, I like the drift"
"some guys have a better relationship with their car than their wife haha. sad but true." alot of inspiration for my black hatch!!!! I did it in an afternoon... probably 2 or 3 hours? I did the roll/pull about two and a half years ago, so I don't remember for sure. It shouldn't be too bad though if you take your time! haha, I can't say there is a ton left to do. I do have some cool stuff arriving next week, including something that I have been looking for for a very long time. Pretty minor stuff though! OK, so minor update. I managed to make it to a meet this weekend for the first time in a while, so that was fun. It was the first time taking Tomei in the car- needless to say, the interior was completely trashed- so I spent most of the afternoon on Sunday vacuuming all of his fur out of the car. My wife and I took the car out to dinner on Monday, so I we snapped a few pics while we were out. I'd like to spend some time actually editing these at some point, but I just haven't had the time so far this week. Pretty sure Damon has been traveling the world for the last year trying to track one down. Shaking people down in dark alleys trying to get them to sell him one. 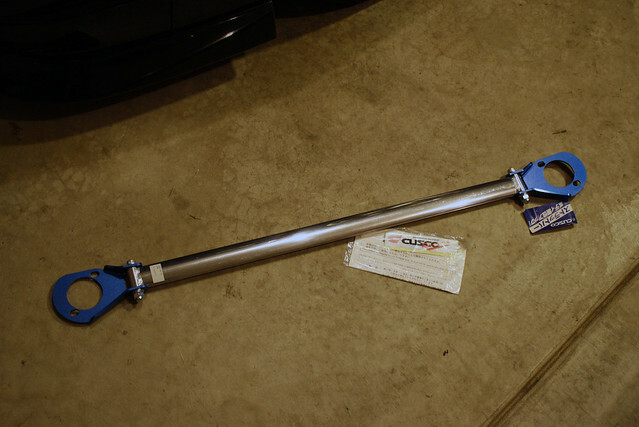 ^I got mine from a friend that drives an Integra. 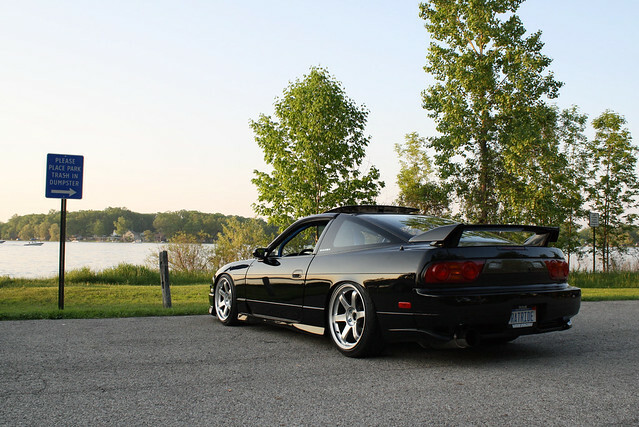 They actually pop up on Honda forums quite often and S13 hatch/DC2 Integra use the same mounting points. I'd heard that, but never from anyone specifically I guess? So until this point I wasn't going to throw down 4 bills for something that the word on the street says fits the S13 Hatch. Now I'll keep an eye on Honda-Tech for one probably. Seems like they go a bit cheaper over there anyway. And sites like JDMland (ICB) still have them I think? When I actually have desire to work on my car, I'll let you know. Not sure if this has been mentioned yet, and I'm sure you already know but your 3rd brake light doesn't work. I am REALLY contemplating getting some Volks for my car after seeing those photos. 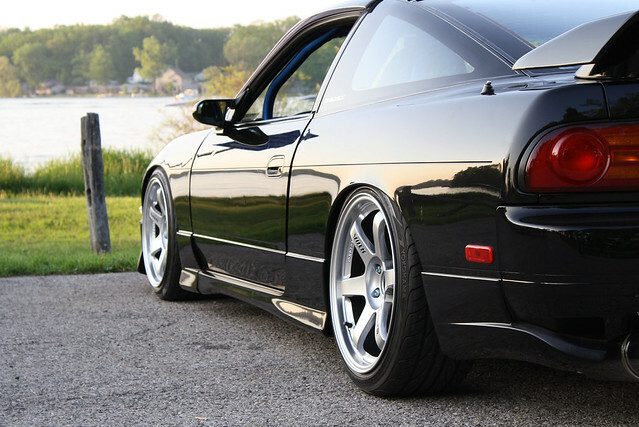 Im debating on those or the new ADVAN TCIII's. I still think silver was the best choice you could have made on for the color combo! Damn the car sounds awesome too. UNLEASH THE BEAST! lol, I noticed that too. I fixed it last night- had some jenky wiring. Thanks PT! I am happy with the color, too. You should score some for sure, haha. The new Advans would look really nice too though! Maybe you can get another set of wheels/tires for cruising and use the Enkeis for the track! lol thanks man! I really love how the car sounds- I'll have to do more videos soon. 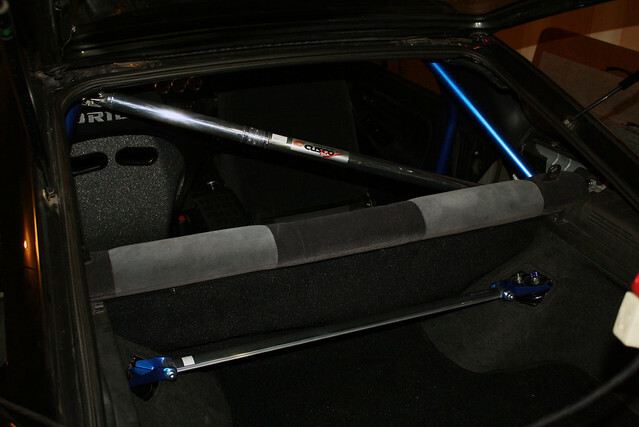 if you put a roll cage on, won't the backseats be of no use as it won't have room for people to sit? So why not just take out the backseats and put a seat cover to save like 20lbs? or something? You won't notice any performance difference with or with out backseat, other than noise differences. Plus roll cage and full interior is for bosses only. The back seats weigh like 2 lbs homie.